The greatest crisis of our time is upon us. This is a world which has survived multiple apocalypse scares and political crises in the past few months. The National Chicken Council has reported that there will be a chicken wing shortage caused by rising production costs which may lead to an increase in wing prices for the Super Bowl. I am terrified, and I have a few thoughts on this grim news. 1) There’s a motherfucking National Chicken Council and I haven’t been made aware of it? How do I receive an invite to this council, and why haven’t I received one already? I’m actually pretty upset, because I figured that as one of the world’s foremost chickenologists I would be at least a member-at-large of the National Chicken Council. This will be rectified, and I will be submitting an application for membership today. I’ll keep you all posted. This is a pretty serious group. Look at their website. 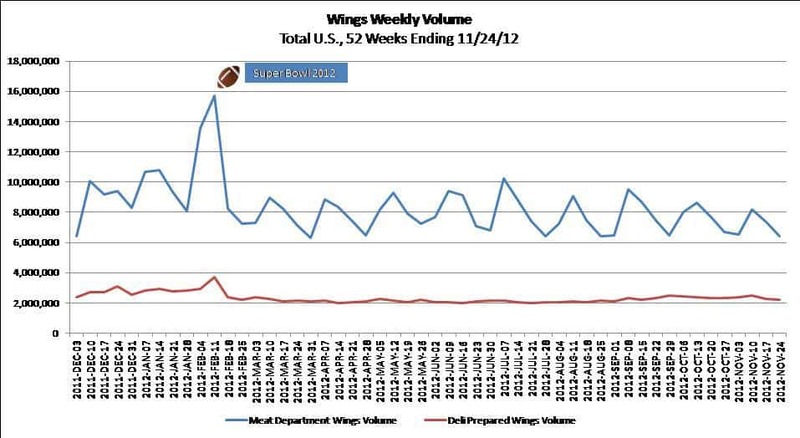 Their 2013 Wing Report is out. This is a thing. An actual thing and it comes with a 52-week analysis of weekly wings volume by deli preparation or meat department. Seriously. 2) How is it possible to run out of chicken? According to The Economist (yes, The Economist has chicken statistics), there are about 20 billion chickens on Earth at any given time. That’s about 4 chickens per person, and if you say only about a quarter of the population via dietary or monetary reasons can eat chickens, that’s about 16 chickens per person. Chickens take about 6 weeks to grow from “Eggs Benedict delicious” to “Chick-Fil-A delicious”, and if you assume the whole number of chickens is reproduced, then we produce about 172 billion chickens every year. That means there’s about 130 or so whole chickens available to every person over the course of a given year. How the hell do we consume this many chickens every year anyways? I know I eat a lot of chicken, but I’m pretty sure I don’t take down a half a chicken every day (……maybe I do). But even assuming I’m average in chicken consumption, there have to be some people out there accounting for quite a few more chickens eaten than I am. Who among you is eating 2 or 3 chickens a day? I’d like to salute you. I understand a “shortage” doesn’t mean we’ll just run out, but it will raise prices on delicious golden chickens, which will either cut our consumption of chicken or of other vital products, like health insurance and grain. I don’t want to be forced to purchase less rice because chicken costs too much. That’s not fair. We’ve gotta get Barack Obama on this. The Chicken Cliff must be on the national agenda. 4) How can we fix it? The easiest answer is to eat less chicken, but seriously, screw that. We could eat chicken replacements, like turkey or tofu wings, but screw that even more. If I’m forced to eat fried turkey wings then the terrorists have already won. I just watched Zero Dark Thirty. We don’t let terrorists win. It seems to me that the only solution to the crisis is to either inject a delicious buttery stimulus under the crispy golden skin of the chicken industry or to make giant, more efficient mutant superchickens that can provide more meat and larger wings. Given our country’s outspokenness about chickens that aren’t homeschooled, fed only manna from heaven, and given separate bedrooms and bathrooms before we kill and eat them, I’m guessing the only option is stimulus. Which means we’d have to get our country’s leaders in on this thing. And it’d be better if we had some sort of long-term government agency to make sure this doesn’t happen again. And it would need a leader. Who else but the guy who wrote this post and came up with the very idea? I just wrote an entire blog post to justify my potential appointment as the United States Secretary of Chicken. You’re welcome.